Your BIG Freelance Writing Dreams? Totally Achievable. 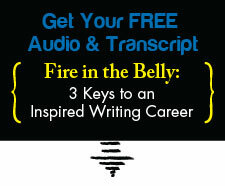 | Writing & Book Coach | Marla Beck, M.F.A. Your BIG Freelance Writing Dreams? Totally Achievable. making great money using your talent and doing work you love. For many of the writers I meet every week, these important and wonderful dreams are their daily reality. These dreams HAVE come true, and these established, successful freelance writers work from home and make a decent (or quite good) living using their minds and talents for hire…working and writing largely on their own terms. Deep down though, these writers – and perhaps you, too — have other, bigger dreams — important, as-yet unrealized dreams that constantly gnaw away at their sense of purpose and power and fulfillment. It can be easy to brush these “big dreams” away, especially when you have consistent work and nothing seems all that wrong. The bills are paid. The clients are happy. The work is flowing. And…you’re aching to do something MORE. Allow that malaise to fester and guess what? You’ll sabotage yourself. Get lazy or sloppy. Your professional reputation will suffer or, maybe you’ll continue to push yourself to produce when you don’t feel like it, eventually running your inspiration, passion and creativity down to a dispiriting, exhausting nub of barely-there. I see this all the time. And let me tell you something: you’re better than this. You deserve to truly, fully embrace your freedom as a freelance writer. What’s stopping you from working to achieve your full writing potential? Why aren’t you taking charge of your passion, your time and your publishing? What’s at stake, if you continue to ignore the call of your heart and ambition and writing talent? What will life be like if you allow yourself to turn 45, 50, 60 or more without ever taking control of your time, your ideas and your pitching and publishing success? The first step to achieving the BIG freelance writing goals you dream of is to cultivate the capacity to see a bigger future for yourself and understand exactly what’s been stopping you from stepping towards it. If you want my help, I’m willing to meet you for a free Breakthrough Session, if you qualify. This free, 45-minute call will get you clarity on your real writing goals, your roadblocks and your own fastest path to true freelance writing success. Contact me today to apply, and we can set up a time to discuss your situation. The moment you take a simple, decisive first step is the moment you’ll begin to feel hopeful and capable and inspired. Freedom, fulfillment and meaningful freelance success are waiting on the other side of your fear. Next post: When You’ve Lost Your Thrill for Writing.